Life is officially moving faster than I have time to blog about it. I'm doing my best to take it all in and enjoy this season of busyness. I feel so incredibly blessed right now with a new house and a baby coming, not to mention family and friends who have been so supportive and helpful! I could turn this into a cheeseball post really quick, so I'll stop there. But I honestly feel so undeserving of these gifts, and I am so very thankful. Just wanted to put it out there for the record. Two weekends ago, we finally started checking some things off our new house to-do list! The list is forever long, but one thing at a time, right? At least that's what I keep telling myself. 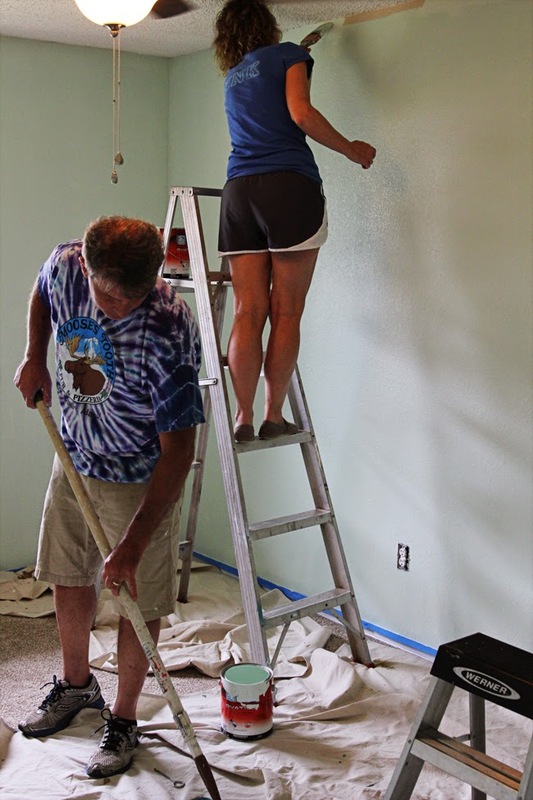 My parents are basically the best and volunteered to drive up from Texas to help us paint a few rooms. The entire house is painted the same color, but it's not a terrible one, so I decided to just focus on painting the master bedroom, the guest bathroom, and Baby Bum's room. No need to get crazy and try to paint everything all at once. I chose "Mint Condition" from Sherwin Williams for the nursery (pictured above). I knew I didn't want a gender-specific color like pink or blue. I wanted something bright but nothing too crazy, and I wanted something that could work for a girl or boy. No, I do not have a theme. Take that, Pinterest. While my parents painted, Jordan and his parents worked on the front and back yards. Unfortunately, I do not have a before-and-after picture to show you. That's a blogger fail right there. Just imagine a jungle with weeds past your kneecaps, and you've got the idea. 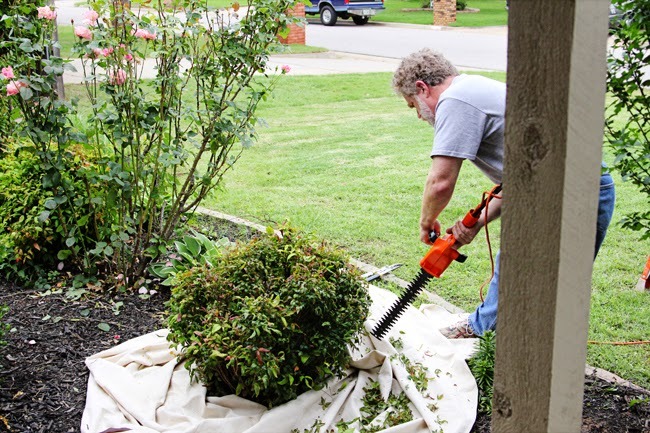 It was awful, and with all the rain we've been having, it needed attention fast before small children started getting lost in the thicket of dandelions. ^^^He was actually finished mowing by the time I ran out with my camera, so I shouted, "Pretend to be mowing!" Hence the confused stare. The previous owners had some nice landscaping out front, so upkeep will be key from this point forward. Luckily, we both know absolutely nothing about maintaining a yard (or, ahem, keeping basil alive), so this should be fun. Now for a few shots from inside the house! None of these rooms are getting painted for now. ^^^ Built-in bookshelves! It's kind of like a dream. We decided we're only putting books on there that make us look smart. We're going to start with buying a copy of the Bible in Hebrew and Latin, everything Shakespeare ever wrote, and throw in a Chinese dictionary for good measure. A fireplace wasn't on our "must haves," but I am excited that it's both gas and real wood, so when it's cold outside it will be fun to light a fire and get all toasty! 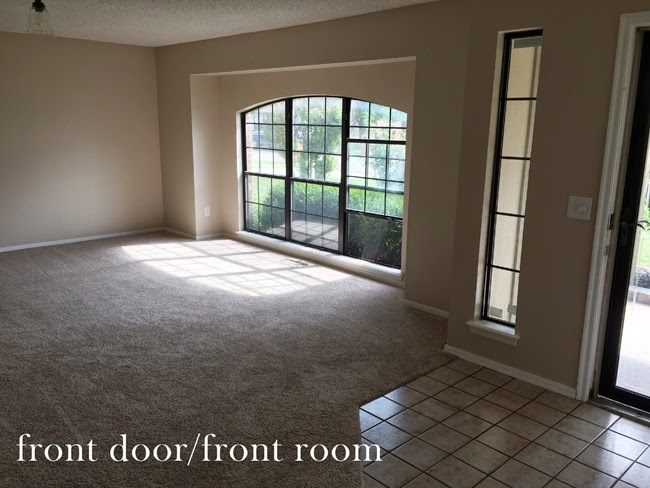 One thing I love about this house is all the natural light! That was #1 on my priority list. I cannot cannot handle dark houses. I am so excited to have some great places to take pictures and read. In related news, Jordan has declared he's already tired of moving. We have literally taken 4 boxes over to the new house. This concerns me. The other day he said, "I'm tired of this giant empty box that's sitting in the middle of our living room." To which I replied, "Maybe you should fill it with stuff." This is what I'm dealing with here, people. I can't decide what's more ridiculous: that someone found this a selling feature or that they actually know this about the toilet, which means they tested it. "Hey, how many golf balls can we flush before this thing breaks?" You KNOW a man thought of this. I picture a team of marketing people crowded around a toilet. "13!" Loud cheers. "14! 15! 16! 17... oh, no it's broken. 16 golf balls it is!" After two full days of painting and yet another crazy Oklahoma storm that nearly had us retreating to the storm shelter (dear May, we are not friends), we actually got to enjoy some sunshine while eating burgers and ice cream at Freddy's. My dad apparently thought there were 25 people eating lunch with us and decided to get an excessive amount of ketchup. So that's the beginning of the beginning of house stuff to do! Excuse me while I go take another load of random items over there. I CANNOT BELIEVE I OWN A HOUSE. And the golf ball thing is rightfully hilarious. I would have taken a photo too. It feels large to me too coming from our apartment kitchen. 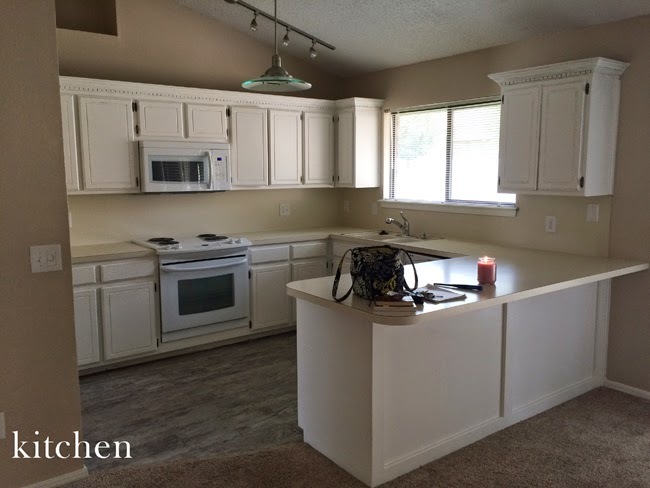 I love how it's open to the living room too, and the white cabinets I think make it look more spacious. The previous owners did a great job doing some updates! It's nice not to have a hot mess of a house to move into. What a great looking kitchen and fireplace, full disclosure I am coveting your fireplace really badly. haha :) Thanks for being honest. It is pretty awesome. I love what the former owners did with the brick! Nice house! We are waiting on the clear to close any time now. Exciting stuff! Can't wait to see it all decorated! Loving your kitchen. The open feel and the white cabinets! How great that you have built ins?! Love that! You really are in an exciting stage!! Your house is just lovely; I think the front room window is my favorite. Are you guys moving hear your apartment or will you have to figure out new commuting routes? That is my least favorite part. Love the mint and love the house! And built ins...swooon! omg!! Cracking me up!!! 16 golf balls? Seriously!!!! Love seeing pictures and love the mint color you chose! Like, seriously who needs to know that?! I feel like that's information only a drug dealer would find necessary in case he ever got raided and could stuff his stash down the toilet. Anyway, looking good! Also, you're pregnant...clearly you need 25 cups of ketchup. 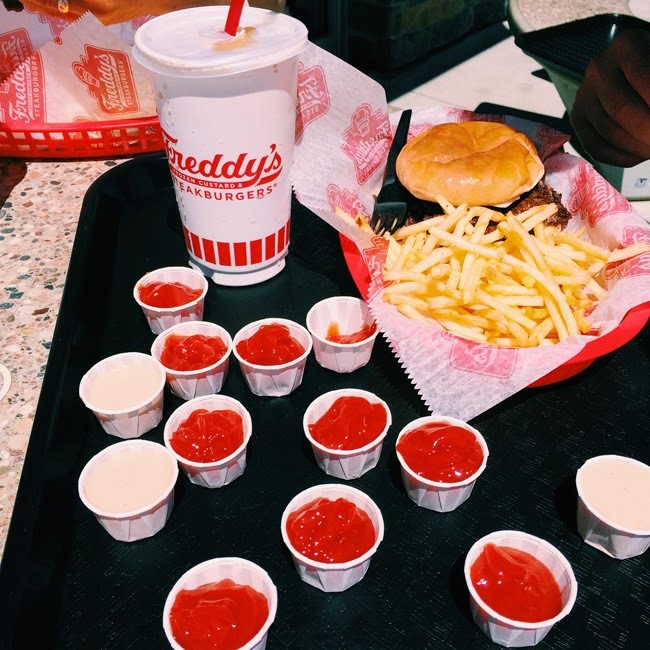 I do love me some ketchup, but we were cracking up because he had some and went back to get MORE, and we were like, how many people do you think are eating??? And yes, a fireplace wasn't a must on our list (oklahoma summers = death), but I really do love it! And I love that it's regular wood burning too so we don't have to pay for electric. Just need to get it checked out this fall before we use it to make sure there aren't any bird's nests. I think Mint is a great gender neutral color. I love the fireplace and the bookshelves. So pretty, and lots of light! Oy, that is not a selling feature of a toilet. Or I guess it is for guys. It looks so pretty! Natural light and fireplaces are my weakness. I could live in a shack for the rest of my days so long as it had good light. Oh, moving....joy. Man Cub has a green nursery too. I love it! And I hate Pinterest and think it should die. So there. I use it to keep up with recipes and oily stuff, and that's about it. Golf balls in a toilet? Who thinks of this stuff?! Life with boys!!! Your house is adorable, and I love seeing bits of it. So excited for you!! What a beautiful house and yay for making it your own! I am in love with that fireplace and those built in bookshelves! And all that natural light. That is going to be the best room ever come cold days. I certainly laughed at the amount of ketchup that you had. I mean I like ketchup more than most people and still, that is a TON of ketchup! Hahaha! Good luck with all your moving! I feel you on not being able to keep up with life- I'm slowing down blogging for now and just hitting the highlights. Too much to think about! Love your paint color choice and your fireplace!! And yeah, we're totally doomed when we have a house... no yard experience over here whatsoever, haha. First of all, I'm so unbelievably happy for you! Second, your new place looks killer. I pretty much melted over the bookshelves, fireplace, and MASSIVE window! For us, things like actually maintaining a yard and having to change a sink ourselves keep us in the apartment/long-term renting realm. This is so EXCITING! I'm very happy for you. I think I'm in love with your house. And the mint! That's the perfect nursery color. I love your smart book idea. I did the same thing! I put all my Shakespeare/Thoreau/Jane Austin/CS Lewis on the mantel and hid my cheesier books in the bookshelves. The built in bookshelves - you know I love those! I also love the color you chose for the baby's room. 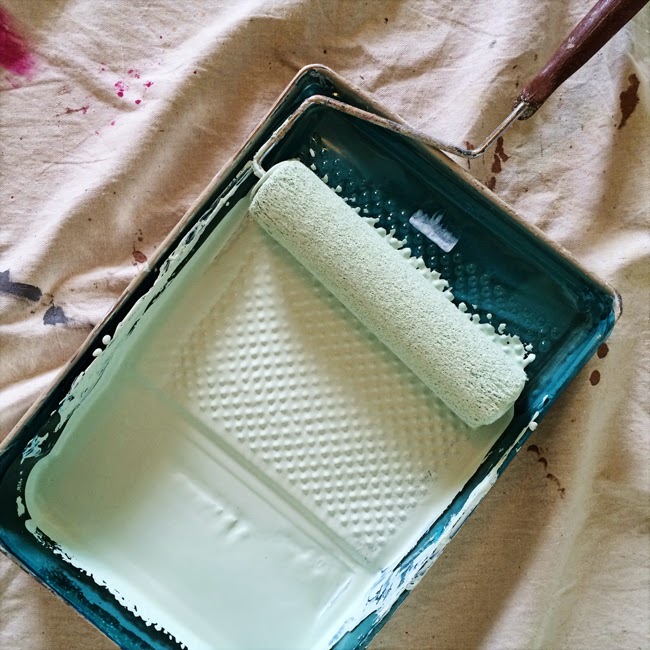 It's very similar to the color I chose for my office when we moved into our current house (chosen because it's gender neutral, light, soothing, and I had that room in mind for a baby room down the road). The quantity of ketchup cracks me up! I hope you said sternly, "We are not leaving this table until you eat all of that ketchup, Dad." Yay!!! The house is beautiful! I love the fireplace and all of those windows. We have terrible lighting in our living room, so I can definitely appreciate lots of good light. :) The color you chose for the room is really perfect. I like that it is gender neutral! PS. I laughed at the toilet advertisement. When I showed Lamar, though, he was like...so what? It must be a guy thing. Ha. And I'm currently obsessed with mint, so full approval there. -YES for the mint. Best color decision ever. -Is that your mom on the ladder? Her legs are killer (...I'm a creep)!! -Your house is freaking amazing. Can I move in? Sounds like one heck of a weekend...I'm so excited for you guys!!! Ha! Yes, those are my mom's legs. I have her giant calves! Congratulations! What a beautiful house! I love everything about this post! I'm glad your house has a ton of natural lighting which is a huge must for any house, in my opinion. I'm also glad you posted some pictures because it is always fun for me to see the inside of someone's house. I know that is weird. Freddys! I have mangoes and you have Freddys. I will be eating Freddys when I get home. They have the best cheese fries followed by a stomach ache. OK! 16 golf balls. That is weird. 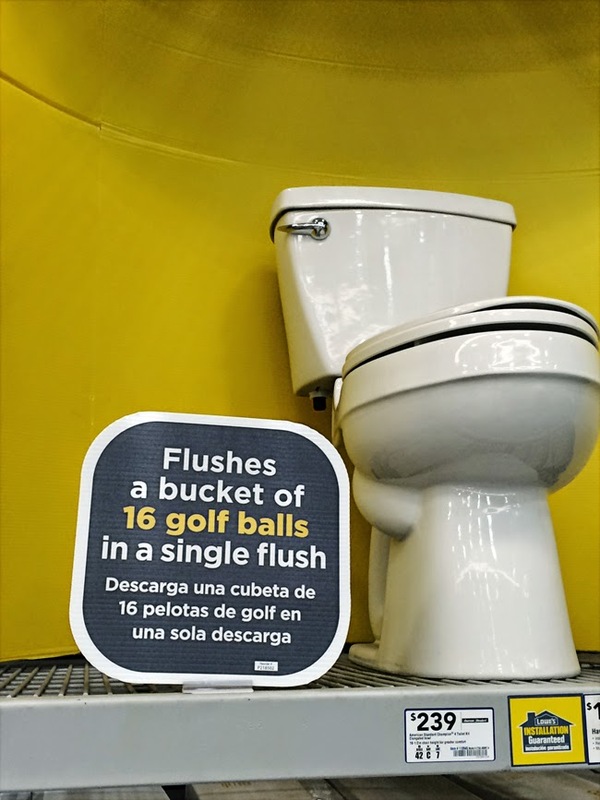 Who takes a dump equivalent to 16 golf balls?? This is so rad and exciting! I will live vicariously through you, as our house buying days are far from now. Also, the color you picked for the nursery is perfect! I love that! It's so sweet that your parents came to help out with all the work that needed to be done around the house! my mother in law gifted us with her old lawn mower, otherwise we'd still be borrowing it!! those things are expensive. i am in love with your kitchen, so much counter space! and i love the mint colour / idea. themes are not my jam. my theme is going to be 'simple - it's a freaking baby's room'. I LOVE the color of your baby's room! It's perfect. I thought that might be you on the ladder, instead of your mom...I may or may not have a picture of myself up on a ladder 7 months pregnant painting clouds on the ceiling...another story for another time. That toilet picture still cracks me up. Getting to the homestretch!! Also your house is gorgeous. I love love love that window in the front room. I'm beyond excited for you guys!!! Thanks for showing us what's going on and what you've been up to!!!! :) I know that moving is a PAIN, but it'll be so worth it! I LOVE that kitchen! And the fireplace. And the built ins. And your strategy for book buying. And the natural light. And that it's in a NEIGHBORHOOD!!!! I hope you guys have really great neighbors!!!! I love your house!! 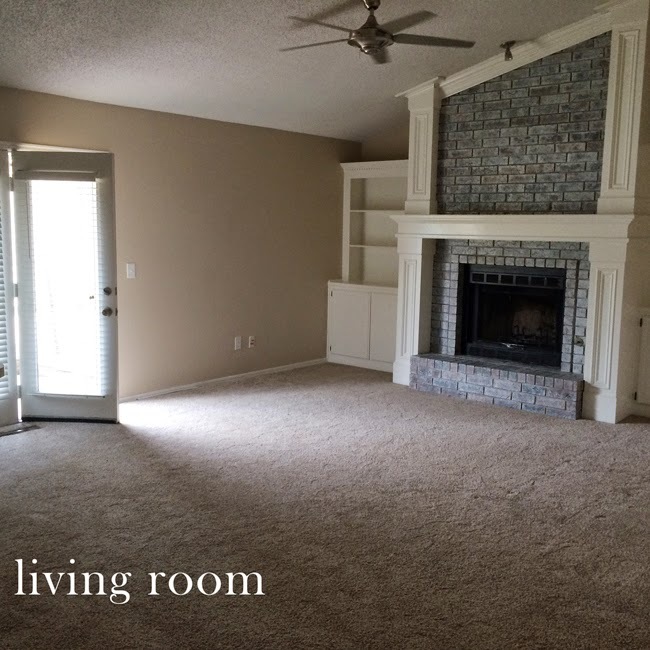 Fireplace WAS on my must have list but somehow, by the time we got outbidded on our first 3 houses we put offers in, I ended up without a fireplace. I am surviving, barely but deeeplyyyy envious of all you people who have them. Also, your white cabinets in the kitchen are SO PINTEREST/BLOGGER TRENDY! LOVE THEM! Eee new houses are so exciting when they are YOURS! I'm way behind but girl we are on the same wave length or something! I was like "holy built-ins" and scrolled down thinking "all that light!" Loving the new house! 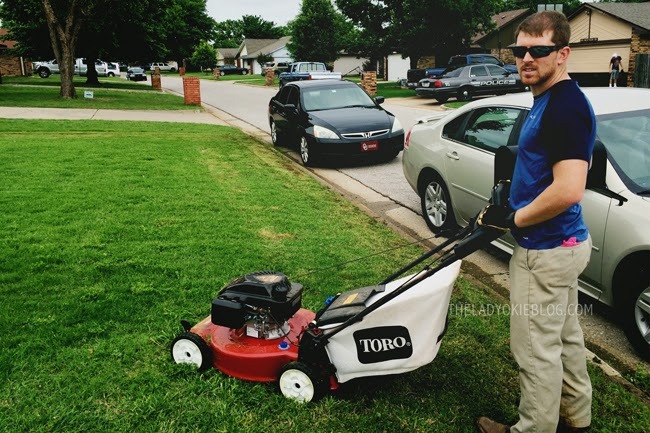 And poor Cory had to push mow our yard (which isn't huge but still took him a few hours) until last summer when we had saved enough to buy a riding lawn mower! He was so freakin excited! Thanks for the comment! I will respond via email and also occasionally in the post thread if you are asking a question that other readers might be interested in. We Registered. It Was Overwhelming. Some posts may include affiliate links. Clicking on them will result in a small commission for me at no cost to you. Copyright Amanda Bumgarner [2010-2018]. Powered by Blogger.